Boogie Wipes : Often referred to as The Boogie Moms®, friends Mindee Doney and Julie Pickens developed the first ever saline nose wipe called Boogie Wipes® as a solution for their kids’ sore, red, runny noses. Using the idea, their business backgrounds and mompreneurial spirit they formed Little Busy Bodies, Inc in May, 2007. After an intensive research and development process, hiring a chemist, surveying consumers and interviewing manufacturers, in December, 2007 they sold their first pack of Boogie Wipes. Sales went on to reach $1 Million their first year of business. Little Busy Bodies now operates out of Beaverton, OR and employs 12 full-time employees (9 moms) including Julie as CEO and Mindee as CMO. The company tripled their revenue in 2009 at $3.4 Million. They now offer 11 saline nose wipe products to 50,000 retail stores across the US and Canada including; Wal-Mart, Target, Walgreens & Toys”R”Us. Their adult line of nose wipes, Achooz, will launch this spring. (Read More). Let me just start out with..This is a wonderful product! I seriously wish these were on the market when I was a kid! it seemed like every other day I had a runny, sore and stuffy nose even in the summer! And yes.. as gross as it sounds, I was a victim of the s-s (Snotty Sleeve) What else could you do BUT wipe your nose on your sleeve when your teacher wouldn't let you get out of your seat when class was in session?.. I was a kid! Don't let your children..or even..(Cough) husband..Be a victim of s-s! 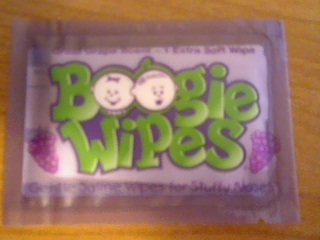 I could hardly wait to try the purple packaged boogie wipes..why?..It smells like grapes! I actually have a stuffy/runny nose today so I grabbed the purple boogie wipes as soon as I seen them, (Rip! Blow, Ahh!) I'm sure you are like me, You HATE blowing your nose because of all the redness, dryness, and pain regular tissues cause. Even with the so called (Lotion) in most of the nose tissues today.. they don't do much for me..Yeah they don't hurt AS bad as regular tissue.. but it's not a dramatic change. That's why one of the reasons I am loving boogie wipes..Besides the awesome fruity smell of grapes that I now have smelled for the last 5 minutes. (Cough) on my nose and hands! ♥ Yeah I used one to wipe my hands and yes.. It did get my hands clean and...Smell fruitylicious. But back to what I was saying.. The boogie wipes are seriously saline coated. The Boogie wipe is soft to the touch and didn't leave my nose dry, or hurt after each use. Not only will you love that so will your kids! The green package (Fresh Scent) smelled nice. I still love the grape smell. But it is nice to have the fresh scent In your pocket, diaper bag, purse, glove department..Ect. for those "Emergency" tissue wipes/Booger removal's in those occasions where you are at work or some where you don't exactly want to smell like grapes. 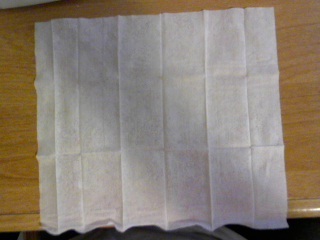 Along with all the other ones, This wipe was seriously coated in saline so no more of those Ouch! That hurts! moments all you moms are aware of. 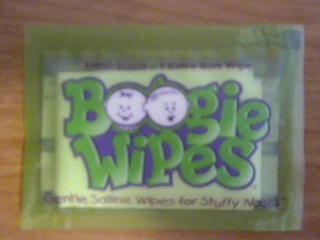 Boogie wipes are Developed by moms tired of chasing runny noses. I love that part. 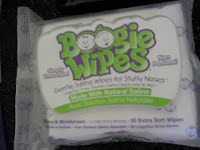 Boogie Wipes Cleans and moisturizes with natural saline. and is Distributed by little busy bodies, Inc.- Portland, Or Usa. The boogie wipe as you can see in the picture is a pretty good size wipe, So you won't have to use half the pack to get the job done. The wipe is soft to the touch so there will be nose fuss from your kiddo(s) about having them blow their nose. I know you have heard the whole..Mom no! It hurts. Or Mommie.. I don't want to! Or the matter of them running off like they ate jet fuel for breakfast. You can find boogie wipes at Target, ToysRUs, Walgreens, Walmart, and Rite Aid. Giveaway Time! The lovely Mom's at Boogie Wipes is giving (one) of my readers (2) packs of 15-count wipes (cool mint and unscented) ..
Go to achooz's Facebook "Like" them, And tell them Laced Kittens sent you! Comment on (THIS) post and tell me you did the first part and besure to leave your E-MAIL and the name that you are google connected Laced Kittens to! Easy right?.. ♥ I receive no monetary compensation for this review. I was provided a Boogie wipes to try and give my honest opinion.